GET AWAY FROM IT ALL, RIGHT HERE. Blue Skies Massage & Wellness is raising the bar in Longmont for professional massage, with a quality of service that is truly unmatched. Our massage therapists are carefully-selected for their ability to listen to your needs and provide the care you deserve. We are highly-trained and experienced in a number of different disciplines ranging from deep tissue to hot stone massage, prenatal care, and of course the highly-popular Swedish massage. Whether it's back pain, a sports injury, muscle fatigue or if you're just coming to unwind and relax, we take great pride in offering you a variety of different therapies; all found under one roof, right here in Longmont. The personal approach to your mental and physical well-being is what sets us apart. At Blue Skies Massage & Wellness, our standard is excellence - as you'll see from what our clients have written about us! After 90 minutes, I walked away more pain-free with more mobility than I’ve had in a year. They have a wonderful facility, an impressive background and absolutely love their craft. Emily Bauer has been my massage therapist for the last five years. I see her every four weeks. She gives me a deep massage that alleviates the stiffness and soreness in my back, neck, and limbs. Prior to beginning massage, I suffered from severe dizzy spells, general stiffness in my joints, and limited movement in my neck. Since I have received regular massage treatments, I feel much better physically and mentally. Emily is a knowledgeable and caring professional. I recommend her without reservation. I have suffered from knee injuries, ankle injuries, shoulder injuries, back injuries… I’m a runner and I probably shouldn’t be! Every time I visit Blue Skies, they fix me up and get me back on my feet in a matter of days. I can’t express how grateful I am to them for keeping me going – and for making room for the occasional relaxing massage, too! Emily has ruined me for all other massage therapists. She’s not just a massage therapist–she’s a healer! Her knowledge of musculature is extensive, and she truly cares about helping her clients. Each massage is tailored to the client and his or her needs that day. Emily’s professionalism, commitment to quality, and nurturing spirit show in every detail, from the chocolate truffle that greets you on the massage table to the hot towels for your tootsies. Don’t spend another dime anywhere else. This place will exceed any expectations you ever had for a massage. Emily will not only make you feel amazing, but will actually fix the problems you came in with. Making her services untouchable by any other therapist! Whether you are looking for one of our signature treatments, a general relaxation session, or a deep tissue massage, we are experts: and in addition, you can enjoy a full body treatment to include your choice of aromatherapy, hot stone massage, or other special enhancements. An organic full-body scrub stimulates circulation and the lymphatic system and aid in the rapid elimination of toxins… enjoy your choice of Hydrating, Detox, Slimming or Cellulite wraps… or just luxuriate in an Ion Detox Foot Bath. We can add premium specialty treats to any service – a soothing eye treatment, a cleansing facial mask or hot basalt stones to really get into tired muscles and help relieve tension. We also offer hot oil treatments, paraffin dips and hydration creme applications. We have been lucky enough to have won the Best Deep Tissue & Sports Massage in Longmont award for the second-year running. Thank you! Emily also placed in the top three business plans in the entire state for her work on Blue Skies Massage. 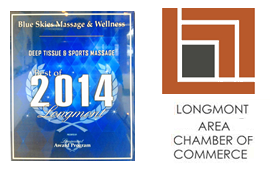 Finally, we’d all like to thank the Longmont Chamber of Commerce for their continuing and generous support.